Duodenal neoplasms are rare and range from benign lesions that can be treated with endoscopic techniques to adenocarcinoma that often requires surgical resection. 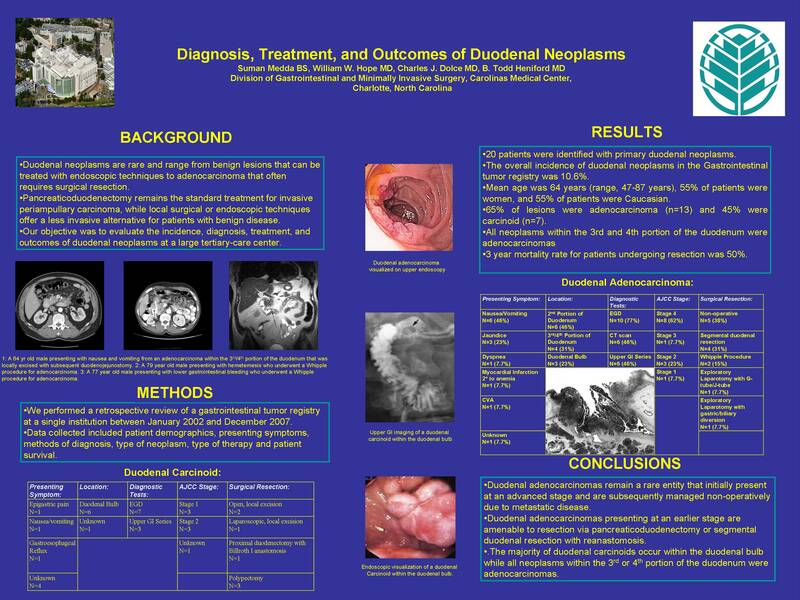 The purpose of this project was to evaluate the incidence, diagnosis, treatment, and outcomes of duodenal neoplasms at a large tertiary-care hospital. A retrospective review was conducted (2002-2007). Patients were identified from the gastrointestinal tumor registry at our institution. Medical records were examined for demographics, treatments, complications, and outcomes. Twenty patients were identified with primary duodenal neoplasms. The overall incidence of duodenal neoplasms in the GI tumor registry was 10.6%. The mean age was 64 years (range, 47 – 87 years) with 45% of patients being male. The most common presenting symptoms were weight loss (35%) and nausea and vomiting (41%). Of the 20 duodenal neoplasms, 13 were adenocarcinomas and 7 were carcinoid tumors. Methods of diagnosis included upper gastrointestinal series (58%), esophagogastroduodenoscopy (63%) and CT scan (53%), with 10 patients having more than one diagnostic study. All neoplasms in the 3rd and 4th portion of the duodenum were adenocarcinomas. The majority of patients were diagnosed with Stage IV disease (n=8). Surgical therapy was undertaken in 45% of patients (n=9) and ranged from local excision (n=6) to pancreaticoduodenectomy (n=1). 66% of patients (n=6) that underwent surgery had negative surgical margins and one of these patients had a recurrence 2 years postoperatively. Additionally, 40% of patients (n=8) received no therapy (surgery, radiation, or chemotherapy). Overall 3-year mortality rate was 50% and 70% for surgical and nonsurgical patients respectively. 3-year mortality was 75% for patients receiving no therapy. Duodenal neoplasms remain a rare entity. We found the majority of these tumors were adenocarcinomas and were diagnosed by EGD. The majority of the patients in our series did not receive surgical therapy as a result of metastatic disease at initial diagnosis.